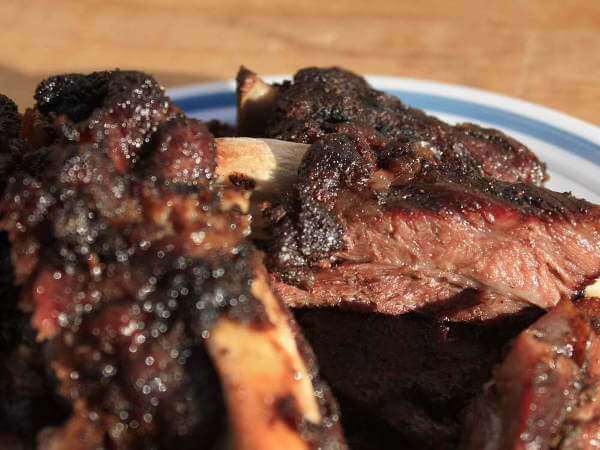 I want to smoke beef ribs (the inner Fred Flintstone in me) but the one time I tried it they were dry. What is the correct process to make them fall apart tender? I assume wrapping in aluminum foil for some of the time is crucial. I have a Masterbuilt Electric Smoker with digital temperature controls. Oh, they forbid it but is it possible to use my Masterbuilt smoker indoors, say in a garage? Right now I'm using an extension cord and the thing takes over half an hour to heat up correctly. Is that right or a little slow? 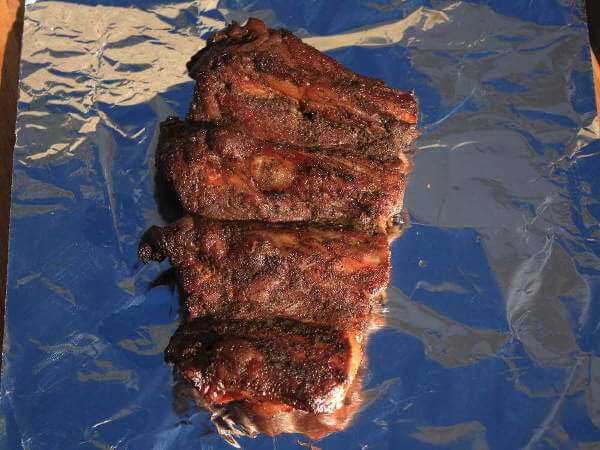 Yes, wrapping the ribs in foil after they've been smoked for several hours will definitely help them cook quicker, and will prevent them from drying out. Further down this page you'll see an explanation of the 3-2-1 rib smoking method, in which the beef ribs are wrapped with foil for two hours of the total cooking time. It's not a good idea to use a smoker in any enclosed space because of concerns of fire, and the possibility of carbon monoxide build up. Nonetheless, a friend of mine set up his Masterbuilt smoker in his shop (poorly sealed, so there was some ventilation). He attached a length of flexible aluminum dryer vent ducting to the top vent of the smoker and ran it out the window. I can't recommend his method, but it worked OK for him. I aborted the 16-hour smoke and went with my version of the 3-2-1 method. I took them out of the smoker a little after 1:30 this morning. Total smoke time ended up being about 6 hours. KEY NOTE: I soaked the ribs in a fairly traditional brine made from water, kosher salt, brown sugar and white sugar for about 36 hours then air dried unwrapped in the fridge for about 12-hours. I used Jack Daniels chips and pellets for the primary flavor and added cherry and apple chips for flavor perfection. After the initial 3-hour smoke, on the rack at 225º I doused the ribs in Bill-b-q Burn sauce (the hotness cooks out) and loosely wrapped them in foil for the remainder of the smoke time (slight deviation from the traditional 3-2-1 method). I did make one rookie mistake. I forgot to remove the membrane on the back of the ribs. It’s not a huge deal but it’s easier to eat the meat if it’s removed before cooking. 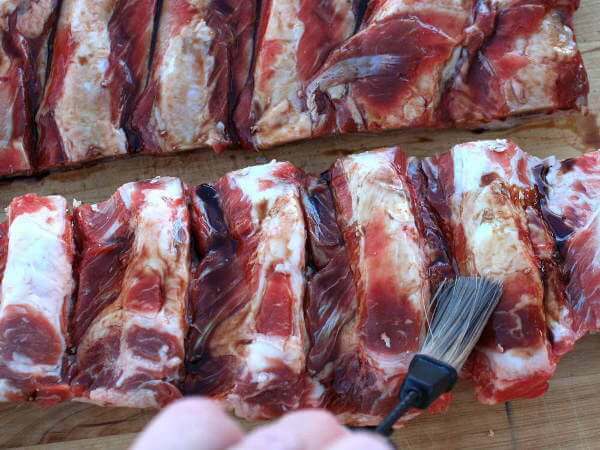 Yes there is a method to tender ribs. It's called the 3-2-1 Method. You smoke at around 225-240 for 3 hours, or until the meat is pulling away from the bone about a 1/4 inch. Then you wrap in 2 layers of foil, to hold in as much moisture as possible. But, before you wrap, mop or spray deliberately with your choice of liquid (I use Apple Juice) while they are sitting in the foil (to catch any excess baste) and proceed to cook 2 hours wrapped, bone side up. Then after 2 hours, unwrap and remove from the foil. Be careful, they may fall apart after the foil "steam". Proceed to cook bone-side down for about an hour to firm them back up a bit. The 3-2-1 Method times vary, depending on rib thickness and type. For Baby Backs, I use a 2-2-1 Method. Also, cooking times are a general estimate. Cooking on a smoker isn't like cooking in an electric oven or range. The meat is done when it gets done and each cut is different. You can't rush greatness. As for putting the smoker in the garage. I would connect an aluminum hose to the smoke stack and run it up and out a window or go without the hose and leave the garage door open.